Question: Today DPRK proposed to evacuate the Embassy of Russia. Will the Ministry of Foreign Affairs do it? 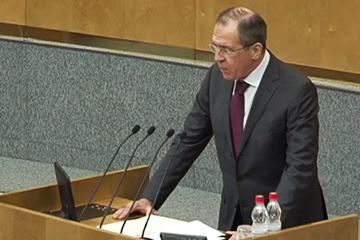 Sergey Lavrov: This offer was made to all the embassies located in Pyongyang. We are currently trying to clarify the situation. We asked several questions to our North Korea neighbours that must be asked in such case. We maintain close contacts with our Chinese, American, South Korean, Japanese partners – parties to six-party talks. We are very worried by the acceleration, though verbal, of tensions. We wish to understand what are causes of the offer to evacuate embassies; whether it is a decision of the government of DPRK or an offer. We were said that it is an offer. I will repeat, considering that many factors are involved here, including those related to other member-states of the six-party talks, we are currently trying to clarify everything. Question: Sergey Viktorovich, how did you negotiations with the Turkmen party take place? Did you touch upon the topic of double citizenship? Sergey Lavrov: Today we had constructive negotiations with the President Gurbanguly Berdimuhamedov and Foreign Minister Rashid Meredov. We were able to discuss all lines of our interaction, noticed our mutual satisfaction with the level of political dialog, development rates of trade and economic links, discussed and cultural and humanitarian cooperation. Turkmenistan indeed pays big attention to the development of cultural links with Russia, support of Russian, but the general academic school named after Alexander Pushkin is a model of institutions of such kind. We would like the “Russian school abroad” project we are implementing now to match such standards. We certainly discussed international problems, our cooperation in the UN, where Turkmenistan supports many initiatives of Russia, including it is a co-author of the Russian project of the resolution of the General Assembly condemning heroization of Nazism. We have talked also about our cooperation within CIS. The Ministry of Foreign Affairs together with the Ministry of Education and Science, as a head government agency, is actively working on the problems our children face when they are adopted by foreign citizens. In accordance with the Family Code of the Russian Federation, consulate employees abroad keep account of minor Russian citizens who were adopted by Russian citizens who are constantly residing abroad, or by foreign citizens or persons without citizenship. These data are updated on-line, however, not all adopters submit a request to register their child with the consulate. Therefore, we are currently including the request concerned into our agreements regarding cooperation in the sphere of international adoption we conclude with foreign countries. Russian foreign representative offices informs the Ministry of Foreign Affairs and the Ministry of Education and Science of Russia about all cases of the violation of rights and rightful interests of adopted children and immediately start dealing with practical steps to clarify what is going on with the specific child. Ladies and Gentlemen, We share the satisfaction expressed by Mr William Hague regarding the launch of the UK-Russia Strategic Dialogue in the “two plus two” format agreed between the President Vladimir Putin and the Prime Minister David Cameron. Today we honestly and constructively discussed our bilateral relations, as well as a range of regional and international problems. We tried not to smooth out the bumps, but rather to review even the most complex issues openly and as partners – be it concerns in the field of human rights or slow progress in the solution of issues regarding extradition of some Russian citizens who are subject to persecution and are in the UK now. I will repeat, this absolutely does not prevent us from seeing common interest in a whole range of critical issues, the resolution of which conditions peace within and around Europe. Question: Taken into account the events in Venezuela, I was reminded of the scene when Hugo Chavez gathered all the presidents of Bolivarian Alliance for the Peoples of Our America and introduced them to the President of Russia. Will the death of Hugo Chavez have a negative impact on the relationship with this community rather than on the Russia-Venezuela interaction? 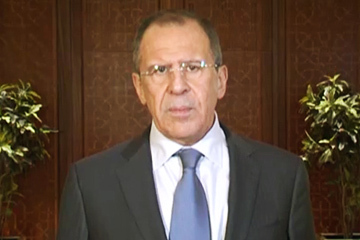 S.V.Lavrov: First of all, we need to attend to the fate of Venezuela and support Venezuelan people during this difficult time. According to our estimations (and this is confirmed by the recent buyout polls in Venezuela), the majority of the population - more that 60 percent - favours the continuation of the policy initiated by Hugo Chavez. Now there is an elaboration of new legal issues that will determine how things in the political process will develop in the framework of constitution and the decisions taken by the Constitutional Court. Of course, we wish the Venezuelan people to make the choice that meets their aspirations and interests of strengthening our strategic partnership. 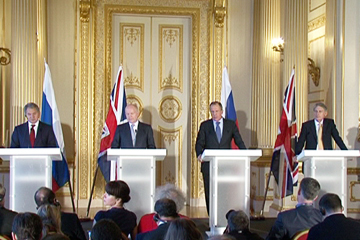 Sergey Viktorovich, you are in London next week for this new strategic dialogue meeting between Russia and Britain. Is this a sign that the relationship between Britain and Russia is continuing to improve, do you think? 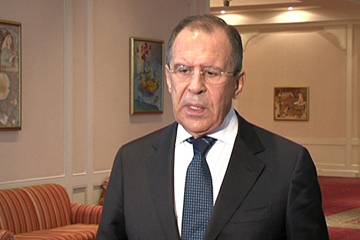 Sergey Lavrov: I would say so. The relations have been developing on the positive lately. This was reflected during the meeting between President V.Putin and Prime Minister D.Cameron, when they met last summer. And the decision of the two leaders to create this new 2+2 format, I think, is a reflection that we both like to continue the improvement of our relationship. Discussions in this format have become a heart-warming tradition. Today we have some sort of an anniversary – we meet for the tenth time in these years. We constantly talk of how much cooperation is important and take appropriate steps to deepen it. 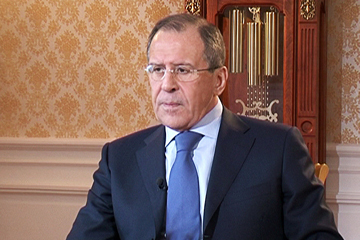 Life itself encourages us to do that, as well as the Order of the President of the Russian Federation, Vladimir Putin, called “On Measures to Implement the Foreign Policy Course of the Russian Federation” of 7 May 2012, emphasizing that the involvement of the civil society into the foreign policy process, the support of extensive participation of foreign policy-oriented non-governmental organizations in the activity of different international expert and political science forums and dialogs is a logical process. We had a very ambitious conversation that lasted more than two hours. We discussed practically all aspects of our bilateral relations and key issues of the international agenda with emphasis on the Middle East and North Africa. In my opinion, the conversation was constructive. I felt the wish of my colleague John Kerry to line up our relations on a track of partnership, certainly without turning a blind eye to the issues that are irritant, including those that have emerged just recently. We mentioned Magnitsky Act, the problem with the attitude of the USA towards the children adopted from Russia. It was decided to move ahead in the situations where our interests match – in fact there are many of them – without turning a blind eye and still trying to solve these problems. They include stimulation of economic, investment, cultural and humanitarian links, also interaction in creating favourable conditions for settlement of different conflicts. It is a pleasure for me to attend the Munich conference again, which has firmly consolidated itself as most authoritative site for open conceptual discussion of European and international politics problems. It is impossible to overlook the symbolism of the date of today's meeting. 70 years ago one of the most difficult, bloody, and crucial battles of World War II – the battle of Stalingrad – was over. Hundreds of thousands of my compatriots who gave their lives for this victory on the banks of Volga were not only defending the Motherland, but also fighting for the attainment of universal peace, just as all our allies were doing. I am very glad to be in Myanmar with a return visit. Our countries have developed traditionally friendly and trustful relations, and in February we will celebrate the 65thanniversary of diplomatic relations. I am satisfied to tell you that my colleague and I agreed to hold a special event on that occasion. Russia sympathizes with the policy pursued by Myanmar’s leaders and reforms aimed at upgrading public life and economy and developing contacts with other world. We are confident that its consistent implementation will open up new opportunities to deepen our bilateral ties in various fields.